The ocean – vast, energetic, calming, countless shades of turquoise and blue, salty, invigorating, and simply enchanting. For many years, I had been less than beautiful whenever I immersed myself, looking much like a drowning poodle. When I finally became an Advanced Open Water diver, something clicked. In a matter of days, I went from wearing nine pounds of weight to zero. I will never forget the freedom of being truly weightless, silently gliding through the depths. 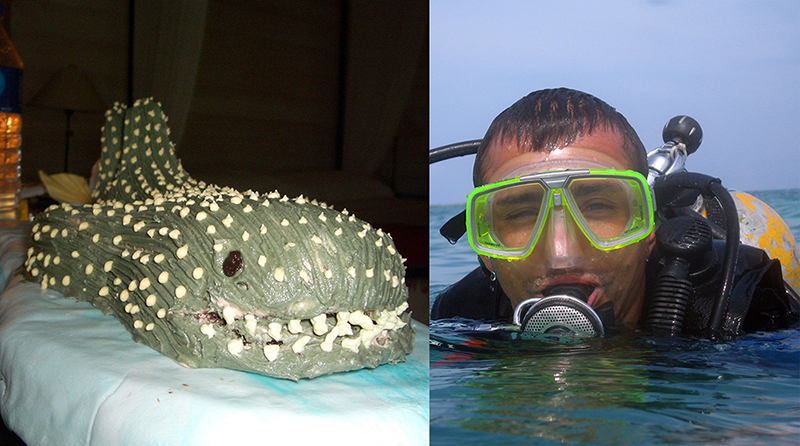 In my room, I was greeted by a whale shark cake. One of my best friends in Switzerland had contacted the hotel in the Maldives and asked them to bake it for me. What a beautiful gesture of support from afar! I ran to the kitchen to organize plates and soon my fellow diving students, our instructor, and I celebrated our success in style. This entry was posted in Book, Inspiration, Memoirs, The Fortunate Nomad, Writing and tagged #book, #inspiration, #memoirs, #thefortunatenomad, #writing on July 17, 2014 by liamklenk.